When I consider how I spend my working days, I would estimate that I spend 75% of my time developing clever ways to get thoughts out of peoples’ heads and onto a whiteboard. Because once the ideas are out there, in some form or fashion, design work is easy. Sprint provides a blue print for design-facilitators. It provides a detailed and thorough explanation of how you can take a small team of people and go from zero to prototype in just 5 days. It covers design activities like goal setting, user process mapping, expert interviews, “how might we” requirements gathering, solution sketching, prototyping, and user testing. As I was reading, I kept putting sticky tabs on sections I wanted to come back to. And I put a lot of stickies in this book. There were so many activities I wanted to come back and try with my team. I also love that throughout the book the authors use real-world examples from brands I recognize, like BlueBottle Coffee, FitStar, and Slack. 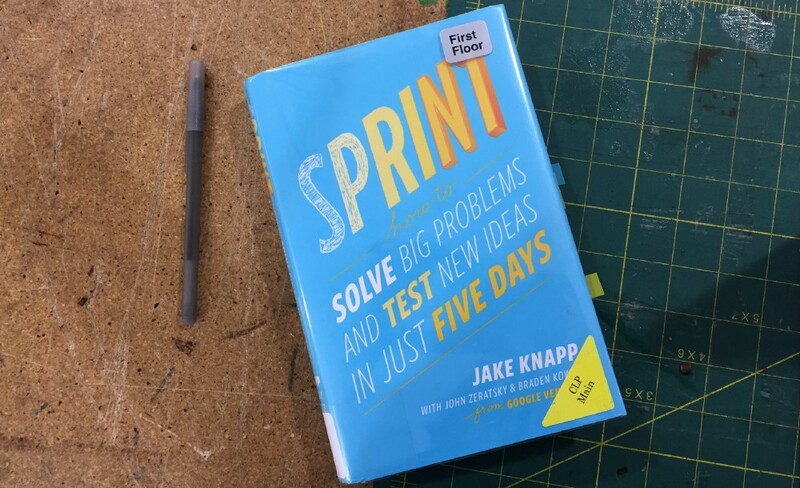 Each company came to Google Ventures with a design problem and, by following the Sprint method, arrived at a viable prototype by the end of the week. One issue I have with the book is that very few professional UX’ers I know have the luxury (or clout) to get all the right people in the same room together for five-days straight. For the authors, this isn’t a problem. They work at Google Ventures, which has provided the funding for the start-ups they work with (and use as examples in the book). Their clients do not need to be convinced of the value of working with them for such a long amount of time. In fact, I imagine their clients feel obligated to. But for in-house UX’ers at a company, it would be an incredible up-hill battle to justify taking up that much time with critical employees. How can you move quickly towards a testable idea when you only have a couple hours with the whole team in any given week? What do you do if you can get time with a few individuals but not the larger group? How can you better communicate the process and your test findings if you can’t all be in the same room at the same time? However, I think you can still get a lot of value from the book without strictly adhering to the intensive 5-day workshop approach. You can take the strategies they present and use them as you need them, when time and team availability allows. Overall, I would recommend this book to anyone who would like advice on how to be a better design-facilitator. Additional resources, checklists, “bonus pack” and slide decks provided by the authors. What are your strategies for facilitating design workshops? What have you found to work best given your own time and team constraints? What is the best incentive you’ve used to get the right people into the room?